Hey June Round-up and Giveaway! 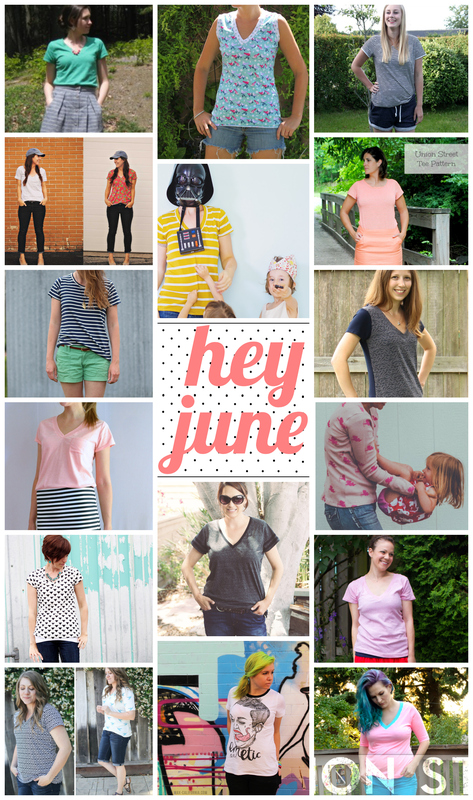 To cap off June, we’re doing a huge Hey June pattern giveaway! You will win 4 patterns of your choice from the Hey June shop. Just leave one comment on this post telling us your favorite thing to do in June, whether it’s summer or winter where you live. I’ll kick it off and tell you that for me, it’s this: Friday afternoon, a lounge chair, a cold drink, and all the neighborhood kids on their bikes! Giveaway open to anyone in the world with a valid email address, one comment only please, void where prohibited. Giveaway will close on July 4 at 12 am EST and be announced on our Facebook page on Friday. In closing, I’ll leave you with this little bit of awesome, from Jessica and Corinnea of Created Blissfully and the best photoshoot I’ve ever seen. Now I have a plan for the next time I don’t know what to do with my arms in a picture. Cuddling up by the fire when it’s snowing outside. Taking my kiddos to the pool! I love the long days spending with my kids. We bowl, slip n slide or just cuddle, it’s great! Our favorite thing to do in June is go to the pool. I love to catch an outdoor movie in the park! Hi Crystal! You’re the winner!! Please contact us, or email adrianna@heyjunehandmade.com to collect your 4 patterns! My favourite thing is going to the beach, but this June was a little windy and rainy, so I hope July will be better. I love spending any amount of time outside camping, swimming, or exploring with my girls! My fav thing about June is eating watermelon with my kids! beach trips!!!! july and august are so hot in florida and may and june are so much better. the next time to go where it is more comfortable won’t be until september. Hitting the swimming pool is our favorite! I love having iced coffee on a warm June day! An afternoon outside with a good book, a chocolate banana smoothie, and my boys playing baseball on the other side of the lawn. Celebrating the birth of my oldest son with a summery party – splashing in the pool with family and friends! I enjoy the longer days that are perfect for evenings at the beach, with the kids. My birthday, my daughters birthday and all her friends birthdays are in June so it’s a month of party dresses, balloons, cake, pimms and frolics! Love June so much! Playing in the sprinklers WITH my kids has been my favorite June fun!!! I love sitting on the patio in the early mornings drinking my coffee and knitting. It’s still cool, all the birds are happily chirping and I can plan the rest of my day, which this june has included a LOT of sewing! My favorite thing to do in June is a tie between my youngest daughter’s Birthday on the 7th and our anniversary on the 24th. Walking my girls (westies) in the awesome evening hours. Riding my horse down the road on a warm evening! My favorite thing to do in June is make sure all my gardens are planted and they look good. It doesn’t always happen, and I end up hoping for a longer growing season. I just got back from a family vacation in Cape Cod. The best June ever. Cold cocktail next to a cold lake on a hot day! My kids sans clothes running around with balloons and bubbles. Precisely what they’re doing right this minute. My favorite thing to do in June is to sit outside in the sun! I love spending time being outside. Picking the first peas and strawberries from the garden. I’m a farm girl so it’s go to sheep sales & shows! Love to go to the beach. Love to sleep in since there is no school. And play in the sprinklers! I love barbecues, lounging and reading a book, and campfires! Celebrating my daughter and inlaws birthday together! We love visiting the snow cone hut! Playing in our pool is our favorite June to-do! A cold drink and a dip in the pool is my favorite thing for summer in general! LOVE sipping a cold drink on the deck, magazine in hand, while the kids play outside. I love the whole family going to the beach on hot days. It’s fun and means the kids will be exhausted and go to bed early! it is SUMMER where i live (austin, tx). this is the 2nd summer i’ve had my little boy (Max) whose bday is in August, so my favorite thing to do in June is to celebrate him being in my life and start planning for his bday. i spent almost 40 years of my life convinced i never wanted or needed to have kids and then he came in and surprised me and i can’t believe i never wanted THIS in my life. i just like to sit and stare at him and marvel at how perfect he is (i’m a bit biased, though) and just watch him learn and grow. i hope i have a 1,000 more Junes to enjoy with him. sorry about rambling!!! My favorite thing to do in June is see the garden start producing great food! My favourite thing to do in June is to burn the bonfire in the paddock with my family. Picking strawberries and eating them right away! my favorite thing that i did this past june was altering a vintage winter nightgown pattern into a summer version for my little girls! While I do love our local outdoor pool, my favourite thing is to pack up all the school uniforms my kids are so very done with and put them away, not to be seen until late, late August! It’s finally summer here in June. I love going to the farmer’s market and packing a picnic for music in the parks. The end of June is good Because that puts me and the kids at a half way point w/3moths to go till hubby comes home mid tour… So for us its fill up each day find something positive Skype when we can and hurry up time. I love watching my kids play outside and making smoothies for lunch to help cool off. I love that I can start sewing sundresses again! Camping, except that I didn’t get to go camping this year :/ Sigh. But I have been enjoying the influx of cherries and other berries! Finally sleeping in when school gets out! :) Just relaxing, visiting family, and friends! I love hiking in the mountains in June. The snow is all gone and going up in the canyons is a great way to escape the heat. Thanks for the giveaway! I love to eat strawberries, watch my garden grow and enjoy the sun in June! The Union St. Tee looks awesome! Best thing in June….watching my husband parade around with almost no clothes on! I have about 5 Gal Pals who all, along w/ me, have Birthdays in June so we usually all get together & go away for the weekend or a week depending on schedules. I look forward to June ALL year long!!! I love curling up under a comfy quilt with a good novel. Berry picking is my June-time favorite! Watching evening fireflies, beach week, early morning in the porch without needing a jacket, wearing skirts and going barefoot! It’s winter here so any day we can throw on some gumboots and play outside it a good day in June. Definitely go to the local water park! Going for long bike rides with my newly retired husband! Pool time with the kiddos! I love sitting on the porch watching fireflies and chatting with family or friends! Swimming in the city outdoor pool! I love to go to the park with my kids when it finally starts to get warm! This summer – swimming with my 2 year old daughter. We are starting swim classes next week too! School ending!! Thanks for the chance to win, such a great pattern!! My favourite thing to do in June is celebrate the last day of the school year (with kids and teacher husband) by having ice cream! Great photoshoot! In June there’s a large annual theatre festival over here on the island I live on, the Oerol Festival. I love to visit the productions, usually quality site specific theatre. June why I love you thee is for the many and many weddings!